Operated by Aileen Woulfe, an Irish expat living in Switzerland since 2004. 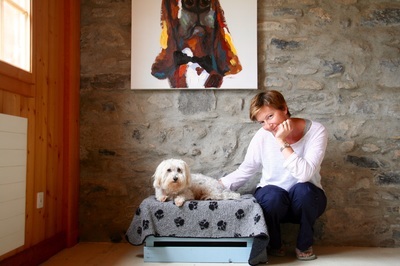 Originally a nurse, later a sales and marketing career girl, lifelong animal lover and now Swiss qualified with a diplôme cynologique in breeding, grooming and kennel management. 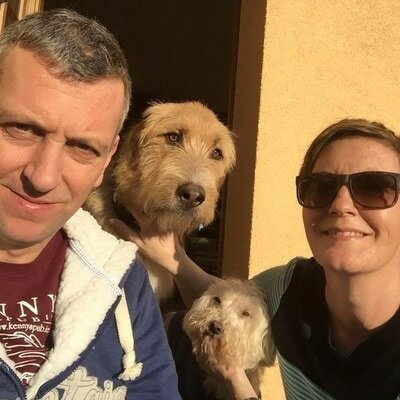 ​Husband Ronan Fitzgerald, also Irish, part time singer-songwriter and full time education management executive, mad about dogs and hiking and always happy to bring Perro and any interested four legged guests out for a ramble around. One of the reasons we set up Happy Dogs Aigle was for dogs like ours. Over the years in Switzerland, we found it difficult to find a boarding facility that catered to the individual needs of the various dogs with whom we have shared our lives. Jessie, our first and much missed clever, gentle Cairn/Yorkie terrier cross who needed loads of mental stimulation and plenty of human contact but not so much of the touchy-feely stuff. Our lovely Bruno, a nervous and hyper Irish terrier cross who needed exercise and reassurance in equal measure. Sid, our current golden oldie coton de tulear born in 2000, affectionate and laid back, happy as long as he's with us and gets a short stroll and a visit to the local cafe every day. Perro, a griffon mix rescued from Spain as a puppy in 2014, playful, energetic, friendly and an outdoors addict. If he was human he would be a super cool snowboarding/kitesurfing dude. 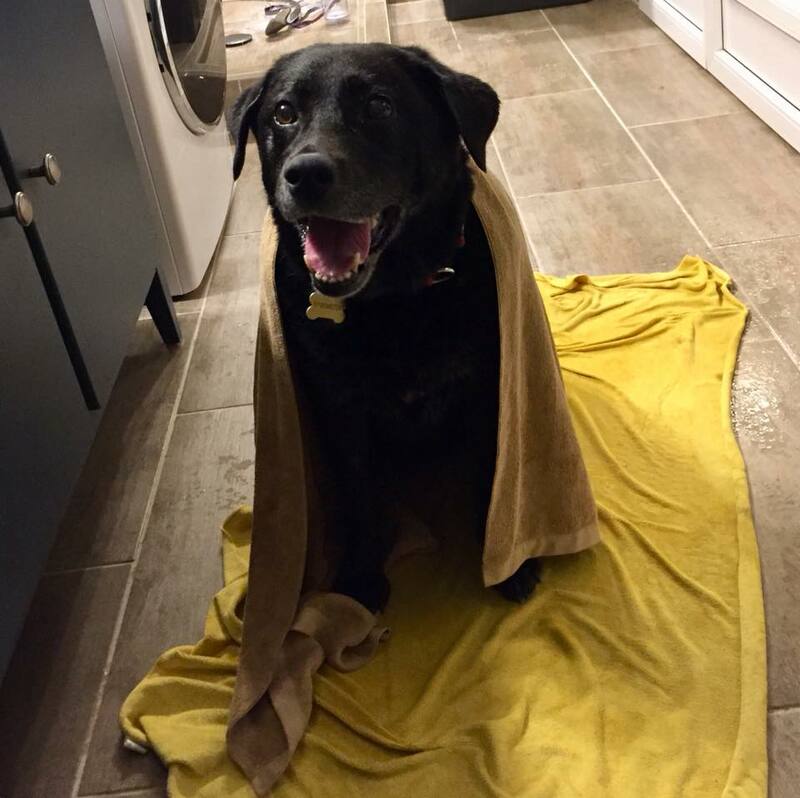 And our newest addition, Gracie, an elderly lab adopted in time for Christmas 2017 who is gentle, calm and a bit "matronly" with the younger dogs in the best possible way! The solution we were happiest with was home care (where our dogs stayed in the minder's house). Our constant issue, however, was the lack of availability. We both travelled a lot, for work and leisure, so this was a major problem. So, having struggled to find a solution for our dogs, we decided to set something up for people like us! Our goal is to offer the best of both worlds - the personal touch found in home care, combined with higher capacity of a small professional facility. ​Every dog differs regarding physical exercise, mental stimulation, playtime, sleep & human contact. With a capacity of 12 dogs we can focus on the individual needs of each dog that stays. We know we cannot replicate home for your dog, but our promise is to treat each dog individually, to make them feel as comfortable as they can be away from home, in a place where they feel safe and cared for in your absence.